This application is over an anticlinal ridge that is underexplored relative to the nearby ridges which host fields such as Alfonsine and Ravenna. Prior exploration in the application area was along the ridge (Mantello wells 1-4) or for onlap plays on the SW ridge flank (3 wells). 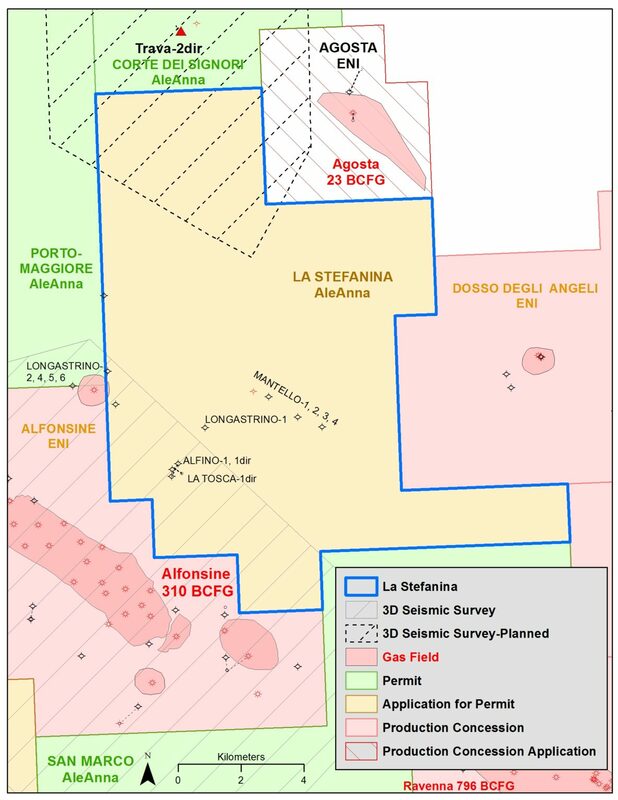 This application was previously Northern Petroleum’s Longastrino Permit, and one dry well (La Tosca-1dir) was drilled in 2012. When the permit was released in 2014, AleAnna filed an application for a new permit (“La Stefanina”). The 3D survey in Corte dei Signori permit to the north shows an anomaly at the edge of the survey, just N of La Stefanina. A 3D seismic survey is planned in this area to locate drillable prospects.